Yet another shark has been captured off a Long Island beach. 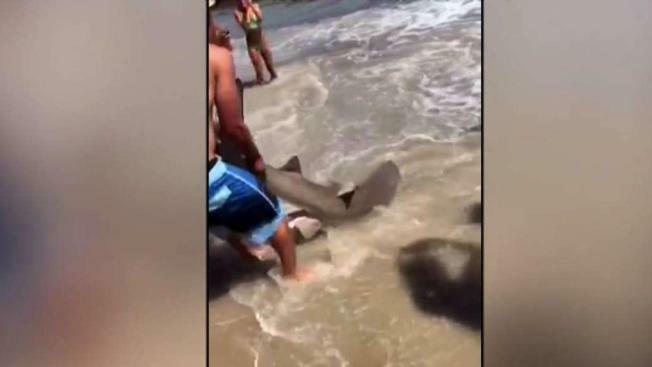 State parks officials say a 4 1/2-foot long sand shark was caught at Robert Moses State Park around 6 p.m. Swimming was stopped while authorities investigated, and then swimming resumed shortly afterward at 7 p.m., officials said. Hours earlier, fields no. 2 and 3 at Robert Moses State Park were also briefly closed when an angler captured and released a 5- to 6-foot shark, officials said. The shark sightings come days after near-simultaneous shark attacks on two children along the same shore. On Wednesday, a 12-year-old girl and a 13-year-old boy were bitten by sharks at Sailors Haven and Atlantique Beach, about 4 1/2 miles apart. Officials said Thursday that the sharks may have been drawn in closer to the surf zone because of the larger population of fish and pods of dolphin there. The wind also kicked up heavier surf, dispersing sand in the process -- and when the sharks went to go for fish, they bit the kids instead, Department of Environmental Conservation officials said. The preliminary findings come after Gov. Cuomo ordered the DEC to lead a multi-agency investigation into the near-simultaneous shark attacks on the 12-year-old girl, Lola Pollina, and 13-year-old boy, Matthew Donaldson, at Sailors Haven and Atlantique Beach. In the case of the 13-year-old boy, Matthew Donaldson, he was boogie boarding at Atlantique Beach before noon Wednesday when he suddenly stumbled out of the ocean. 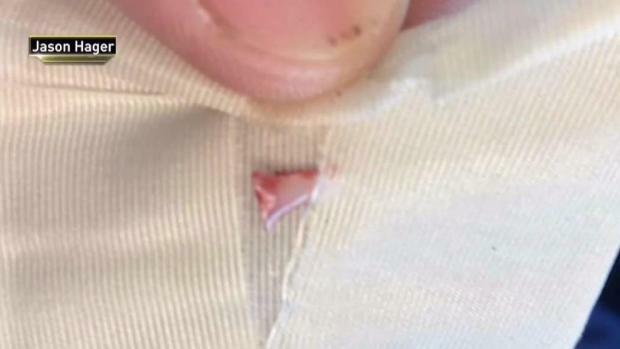 A lifeguard ran to him and found what appeared to be a shark bite; the tooth was still wedged in the boy's leg. The DEC said Thursday the tooth was broken and fragmented, and likely came from the bottom jaw of the shark. They could not definitively identify the species of shark, but believe it came from a sandbar tiger shark. Swimmers on Fire Island are concerned after two children were bitten by sharks Wednesday, and another shark is caught. Greg Cergol reports. In the Sailors Haven attack, the 12-year-old girl, Lola Pollina, said she was waist-deep in the water off Sailors Haven. "It was just like a quick kind of pull," she said later. "I was kind of in like shock, almost, 'cause it pulled and I kind of looked at it and I was like, 'Oh, my gosh." She ran out to her mother with a bloody leg, and the two ran to the lifeguards, who bandaged it and helped them. Most Fire Island beaches were shut down Wednesday as authorities investigated. The town of Islip said its beaches reopened Thursday; added security will include more eyes on the shores and jet ski riders. A chopper will also circle the water for an aerial protective view, a spokeswoman said. Both children have been released from the hospital and are expected to be OK.
Shark sightings aren't uncommon on Long Island or at the Jersey Shore, but unprovoked attacks are rare. Since 1837, only 10 shark attacks have been reported in New York. Fifteen have been reported in New Jersey and one in Connecticut. Two young children are believed to have been bitten by two different sharks within minutes of each other off the coast of Fire Island. Checkey Beckford reports.